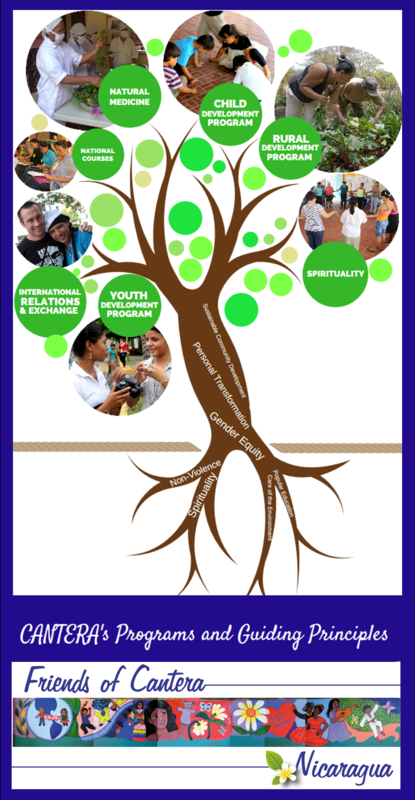 CANTERA's mission is to promote gender equality and spirituality through participatory formation processes, based on Popular Education, that strengthen individual and collective identities contributing to the betterment of the level and quality of life of the most vulnerable sectors of the rural and urban areas. Through participating in dance, theater, karate and English classes, and by attending workshops on gender equality, violence prevention, teen pregnancy, spirituality, self-care, the environment, and communications, adolescents and young adults become well-rounded leaders in their communities. CANTERA accompanies over 300 young adolescents and youth in the Jorge Dimitrov, San Judas, Ciudad Sandino and Mateare Community Centers, located in and around Managua. CANTERA’s Rural Development program implements ecological agricultural practices for basic grains, herbs, and fruits for the diversification of gardens and the improvement of local food security. It promotes environmental conservation by utilizing techniques that efficiently use natural resources. We offer educational workshops on various organic agriculture techniques including raised garden beds, drip irrigation systems, bio-filters, and vermiculture as well as courses in beekeeping and food processing which are skills that help Nicaraguans, especially women, achieve economic independence. CANTERA works with families to support the educational, emotional, recreational, and spiritual development of children. In 220 children ages three to five begin their schooling in CANTERA’s two community preschools. In addition, CANTERA’s Child Development Program provides children ages six to twelve with dance, theater, karate, and homework help classes as well as game time. While exploring their interests and developing their talents, children learn about gender, anti-violence, spirituality and leadership. CANTERA offers workshops throughout the year for community health advocates to learn more about alternative medicine and holistic health techniques. Additionally, CANTERA supports a network of Natural Medicine Clinics in Nicaragua which specialize in the use of medicinal plants and other natural ways of preventing and curing illnesses and diseases. CANTERA's vision is to achieve a society that is more just, equitable, and sustainable by promoting integral human development that recognizes diversities of gender, age, ethnicity, and economic conditions; establishes a dynamic and harmonic relationship with nature; and permits the ethical and spiritual fulfillment of people and society. CANTERA’s methodology implements spirituality which reflects on the inner self with a focus on personal and spiritual development. Through ritual dances and spiritual practices compiled from various cultures, we express dreams and aspirations, and connect to all life. Spirituality is recognized as an essential component of our holistic being, along with our mind, body, and heart, all of which must be equally cared for. Delegations, volunteers, and interns immerse themselves in CANTERA's social programs, simultaneously learning about Nicaraguan people and culture. Building cross-cultural relationships of solidarity, we can contribute to systemic change for a more equal and just world.